Design efficiency was achieved by interfacing the virtual prototype with the structural analysis model. This interface tool pioneered the way for international research projects. The stadium design was conceived as a “Jewel in the Park”, being located within a public park close to the centre of Donetsk. It has become an important architectural symbol for the city and formed a fundamental part of the successful campaign of Ukraine and Poland to jointly host 2012 UEFA European Championships. The roof and upper tier have been sloped to follow the gradient of the surrounding landscape. This not only reduces its impact on the park but also ensures maximum sunlight onto the pitch resulting in improved growing conditions for the grass. The internal stadium bowl was analysed using wind tunnel modelling and CFD analysis to determine the optimum natural ventilation arrangement while the double-skin façade with a naturally ventilated cavity reduces solar gains and the internal surface temperature to further ensure spectator comfort. Development of the first FIFA 5 Star football stadium in the Ukraine. The stadium project consists of four main elements; an iconic 40,000 seat capacity UEFA 5-star football stadium in Leninsky Komsomol Park, Donetsk. Enabling works to prepare the stadium site for the stadium, external and infrastructure works within the Park. Fit out of the stadium for hospitality and revenue generating facilities and infrastructure works external to the stadium but within the Park, to serve the stadium and link to and/or upgrade existing infrastructure. Project management for the development stage for the construction phase of the first FIFA 5 Star football stadium in the Ukraine, prior to the appointment of major international Design & Build contractors, providing supply chain reviews, prime contracts, project initiation and procurement advice The project consisted of four main elements; an iconic 50,000 seat capacity UEFA 5-star football stadium in Leninsky Komsomol Park, Donetsk; enabling works to prepare the stadium site for the stadium, external and infrastructure works within the Park; fit out of the stadium for hospitality and revenue generating facilities and infrastructure works external to the stadium but within the Park, to serve the stadium and link to and/or upgrade existing infrastructure. Outline, scheme and detailed design including specification documents for sound system and acoustic performances of building elements. Arup’s design skills will feature alongside the football talents of Ashley Young, Franck Ribery and the rest of the players at this year’s European Football Championships. 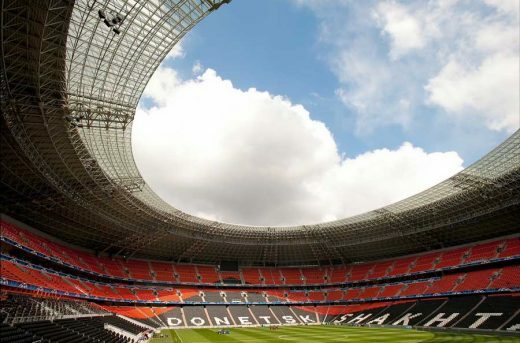 The Arup-designed Shaktar Donetsk 50,000-seater stadium – the Donbass Arena – will play host to the opening game in Group D between France and England, as well as several other matches, including the second semi-final. Arup played a key role in the design team that produced the €320 million Donbass Arena, which became the first new FIFA compliant football stadium built in a former Soviet country when it opened in August 2009. The Donbass stadium is just one of many major stadia commissions for Arup, extending from the City of Manchester Stadium to the Allianz Arena, so the fans will enjoy the atmosphere no matter what the final score. The arena was officially opened on 29 August 2009 with a concert from pop star Beyoncé.